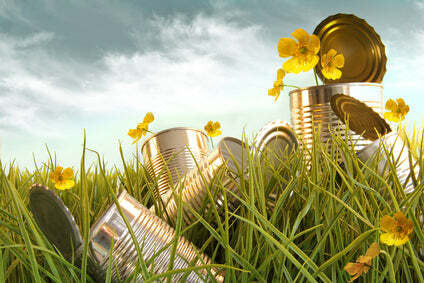 Home » News » How Long Does It Take for Trash to Decompose? 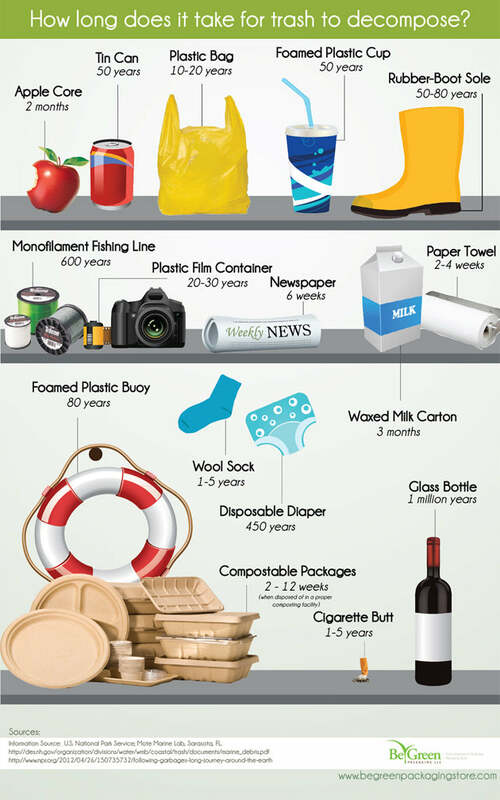 Have you ever asked the question: how long does it take for trash to decompose? The answer varies depending on the type of material and environment. Trash decomposition rates are faster when materials are exposed to the elements. However, when buried in a landfill, trash decomposition is much slower. Materials that decompose within a matter of weeks include paper towels, cardboard, food waste, wood-based products, and natural fibers. Materials with slow decomposition rates include man-made materials like nylon, rubber, plastics, metals, glass, and styrofoam. Plastic decomposition time varies tremendously depending on the type of plastic and the environment. Some plastics will break down in as little as a year under the right conditions. * View full infographic here. Unfortunately, even plastics that break down quickly have a dark side. As plastics break down, toxic chemicals leach into the soil and groundwater. If they decompose in a body of water, the marine life absorbs the toxic chemicals. Scientists are now finding plastic fragments in fish around the world. Since we eat fish, it is reasonable to assume that we are eating our trash! Styrofoam is a troublesome material because it is comprised of tiny balls of plastic. As it breaks down, these balls are released into the environment. They get spread by wind and water, find their way into watersheds, and eventually make it to the ocean. Fish and birds cannot tell the difference between poisonous styrofoam fragments and real food. Somewhere between Hawaii and San Francisco, there is an island of trash that is 80% plastic floating in the ocean. The island is estimated to be more than twice the size of the state of Texas and growing everyday. It is an environmental embarrassment for humanity and visible evidence that plastic decomposition time is much longer than it is for organic or paper-based materials. Trash decomposition for naturally derived materials such as paper and cardboard is much faster than plastics, metal, and glass. Paper and cardboard respond quickly to the planet’s natural decomposition processes while man-made materials suffer from slow decomposition rates. Next time you have the option of choosing between a plastic or a compostable container for your takeout, choose compostable so that your trash does not become your legacy.